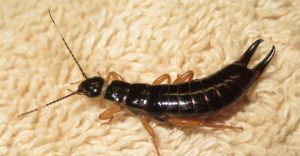 Earwigs are harmless but the pincers on their rear end can cause fear in some. They are named after a myth that they would crawl into the ear and burrow into the brain. They do not infest homes but will become accidental invaders. You can vacuum or sweep them up. If there are large numbers of them a pest control service may be needed. General Integrated Pest Management (IPM) practices can help keep them & other pests out. -Make sure doors & windows are sealed tightly. -Keep yard around the house trimmed and dry.